Let's create clustered back end exchange servers. * We will be using two 2003 r2 enterprise servers. * We will create a private network for a heartbeat monitoring. 2. Copy files under the "Windows 2003 R2 ENT - Base" folder to each "exbe01" and "exbe02" folders. 3. Open them on the VS admin web site, one by one, and go to "Virutal Machines" -> "Configure" -> "Windows 2003 R2 ENT - Base" , and change the machine names. 4. Do not start them yet. 5. Go to the top menu of the VS admin website. 6. Create a new network, this time call it a "heartbeat" and do not enable the DHCP. 7. On each machine add the "heartbeat" network. 8. Add a new SCSI card to each machine. Edit configuration -> SCSI Adapters -> select "Share SCSI bus for clustering"
exbe01 will use SCSI ID 6, exbe02 will use SCSI ID 7, add two SCSI adaptors each. exch01 , Virtual SCSI adaptor 1 : ID 6 "Share SCSI bus for clustering"
exch01 , Virtual SCSI adaptor 2 : ID 6 "Share SCSI bus for clustering"
exch02 , Virtual SCSI adaptor 1 : ID 7 "Share SCSI bus for clustering"
exch02 , Virtual SCSI adaptor 2 : ID 7 "Share SCSI bus for clustering"
9. Create disks that will be used by shared SCSI cards. - Make sure both machines are off! From the VS server admin web site, Virutal Disks -> Create -> Fixed size virtual disk. Name the first HDD as "ExchangeQuorum" -> Size 1 GB. Create another one this time name it as "ExchangeData" -> size 2GB, fixed size. 10. Change the configuration on exbe01, add the "ExchagneQuorum" disk to the first SCSI card (SCSI 0 ID 0). Initialize and format the disk 1 (1GB), this will become a quorum disk , give disk letter Q:, and label it as "quorum"
Initialize and format the disk 2 (2GB), this will become a exchange datbase and log disk , give disk letter X:, and label it as "exchange_db"
6. It will start to analize, when it is done you should see this screen. * If you get a yellow ! mark, go back to the beginning of this article and verify your work, you might missed to initialize Q / X drive or NIC 2. 10. Check the proposed Cluster configuration and make sure it has Q: for the quorum. 12. 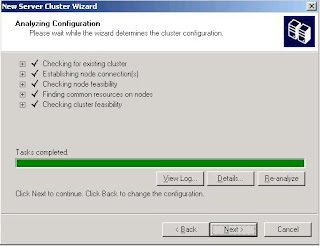 On cluster is created click the Next> button. You just created the exch-cluster, that will manage your virutal servers. Install MSDTC on the exbe01. It is under Add remove program -> Wdinows components ->Appliocation server ->"Enable network DTC access"
Next time we will add exch02 to the exch-cluster.